Add a fresh twist to your every day baking with Stork Bake! The best-baked goods begin with fresh ingredients. Using quality ingredients will add a delicious twist to your baked goods. Fresh ingredients provide nutritious value, adds better flavour, and an authentic taste into your baked goods. Eggs add moisture and help your cakes rise. To reach those baking heights make sure to use good quality, fresh eggs. Other fresh ingredients include adding seasonal fruits. When seasonal fruits are added to your baking it’s always a crowd pleaser. They are beautiful in addition to adding amazing flavour. 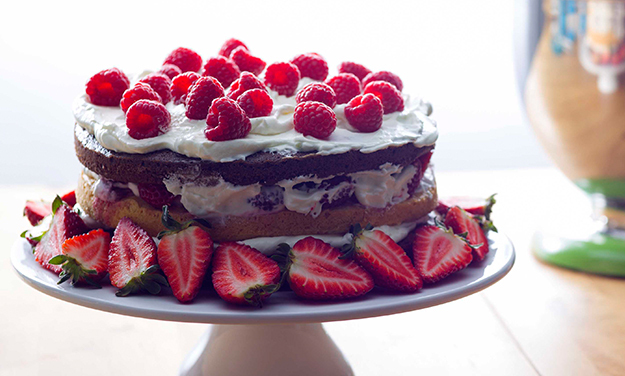 Fresh fruits like the mix of strawberries and raspberries enhance the chocolate flavour in our Stork Bake Chocolate Layer Cake. Other fresh ingredients include milk and buttermilk. Buttermilk is an ingredient that plays a vital role in your baking. Besides moistening your baked good, it helps give it an irresistible softness. Everyone loves soft scones or a moist cake. Using good quality fresh buttermilk will help add a rich depth to your baking. For the best baked good – use the best ingredients, use Stork Bake! Happy Baking! in "cupcakes, Easter, Holiday Baking, Holidays, Peppermint Crisp"
in "Apple Crumble, Potjie, Salted Caramel, Treats"